Megan Young, as a child, had a habit of walking and pretending that she was a model and a beauty queen. She was not dreaming of becoming one. She simply acted like one. 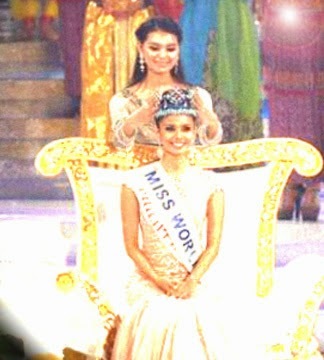 Some twenty years after, Miss World crowned her as Miss World 2013. China Crowning The Philippines - Prophetic? In the book "The Magic Of Believing", it told a story about a young American girl who believed that she was a princess. Many years after, a prince in India fell in love with her and they got married. Back in college, my classmates thought that I was rich. I never argued with them. I let them believed that I was rich even if I was not. When I was working in the corporate world, the people around me believed the same. They believed I was a rich man. But I never disagreed with them. I simply allowed them to continuously believe that I was a wealthy person even if I was simply an ordinary man. Why did they believe as such? Upon learning that I lived in a city popularly known as a city for the wealthy, they automatically believed that I was wealthy as well. Not knowing, that in that city, there lived poor families as well. Being a poor guy, back in college, I believed that I didn't have to look poor, dress up like a peasant, and behave like an uneducated person for the reason that I was in fact a poor guy. I dressed up like a rich man. I behaved like a rich man -- cultured and educated. I speak with manners and follow good etiquettes. I observed how wealthy people behave and move. I read materials about good manners, etc. I believed inside me that I was I rich guy even if in truth I was not. For that reason, people regarded me as a rich person. I took that as a complement and would simply return a smile. My belief was that a poor person doesn't have to look and behave like a poor man; otherwise, that would be double jeopardy. Self image is important. If you carry yourself with a self image that exudes who you want to be someday, better start believing now. As far as self development is concerned, who you want to be now is what you are.